Here compare the specifications of Aakash and upcoming UbiSlate 7 (aakash 2) on key parameters and found UbiSlate 7 quite better than Aakash . Aakash runs on 366 Mhz which is very poor processor speed in today’s world . UbiSlate 7 (aakash 2) on the other hand runs on 700Mhz processor . So with UbiSlate 7+ you will have a double power processor . Aakash has 256 Mb of RAM while Aakash 2 has 256 Mb RAM with 2 GB internal memory . Aakash offers WiFi while Aakash 2 (UbiSlate 7) offers WiFi , GPRS with SIM and phone functionality . 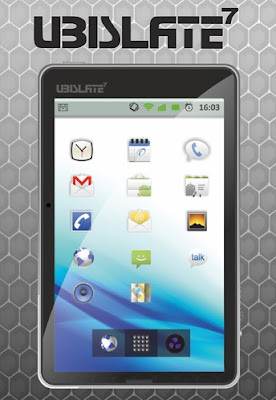 That means you can use UbiSlate 7+ as phone also . Aakash 2 has both back and front facing camera , while aakash doesn’t offers this . aakash tablet is available at the price of Rs 2500 while aakash 2 will be available at the price of Rs 2999 , which is quite justified on the basis of newly added features .